This week, it's another chorizo! Everyone likes chorizo, right? Let's give this one a whirl: Tofurky Chorizo Style Grounds. 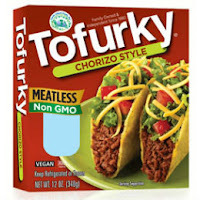 The Tofurky people recommended a wide variety of ideas for this product, but I went my own direction with it. And honestly, it was probably the best meal I had all week. Unfortunately I un-did both the vegan and gluten-free qualities of this fake meat in the process, but you could modify it to your own diet. Check below the review for my recipe! I cooked this up with some bell pepper, onion, and zucchini, all from our local farmer's market. Then, and here's where we get crazy, served it up in some tortillas with Mexican rice, cheddar cheese, egg (scrambled for me, over easy for my wife), salsa, and sour cream. I'll be honest, when I was throwing this together, the zucchini was totally an afterthought - I had some, cut up, in the fridge, and I thought, hey - I'll just chuck this in too. But seriously, it added a great dimension to the entire meal that I think really made it great instead of simply good. I imagine it would be just as good without the dairy and eggs, but we're not vegans here, so I'll leave the experimenting up to you fine folks. If you're going the gluten-free route, you could use corn tortillas instead of the flour tortillas we had on hand, and I'm confident that would work very well. When I ate this as leftovers the next morning, I had the rice, the veggie/chorizo mixture, a little bit of sour cream, some salsa, and a couple eggs cooked on top (no cheese, no tortilla), but my former exchange student from Japan who is now back in the state as a college student had just the veggies and rice for her lunch, and she liked it as well. So really, you could have this in a multitude of ways. Just don't skip the zucchini! Quick note on the chorizo on its own - I heated it up and tasted it plain before adding it to the veggie mixture, just to make sure it was going to be okay, and I was pleasantly surprised to note that it was actually pretty good on its own. Nicely chewy, like a ground meat should be, and a good flavor without being overly spicy. People who like a lot of spice may want to add something like, I don't know, Tabasco, or a hot salsa or something. Whatever spice-lovers eat. You'd know better than I would. whatever else you like on this sort of thing - I can't do everything for you! For the veggies - just heat the oil and veggies in a large skillet over medium-high heat until they reach the desired texture. I think I cooked mine for 7-8 minutes, stirring occasionally. Add in the chorizo grounds, and stir until the mixture is completely combined, and heated through. Serve with whatever other stuff your heart desires. Enjoy! This week, it's time to explore some more fake seafood. Not so sure about this, but here we go. 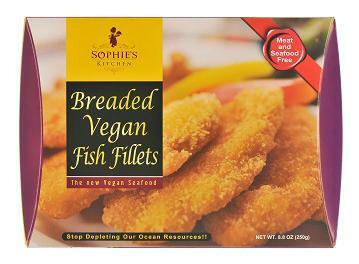 Let's take a look at Sophie's Kitchen Breaded Vegan Fish Fillets. First of all, the box claims that these are "perfect for…everyone who just loves scrumptious food" - well, as I'm a fan of scrumptious food, I was led to believe this was going to be good. So I popped these into the oven, cooked them for the suggested amount of time, and then about 10 minutes more, hoping they'd crisp up, even a little. They look like they were going to get nice and crunchy, but they never got much crunch to them. Just a tiny bit on the edges, and I waited until they had some good color to them. Maybe I'm supposed to burn them to get them crunchy? Alright, looking past the exterior, how was it? Well, the inside was mushy and stringy-looking. There were some weird white speckles all over the fillets, and after checking the ingredient list, I decided it was related to the "multigrain blend" listed - the white bits were probably oats or something. But how was the flavor? Well, not even the slightest bit fishy-tasting. It's hard to describe exactly what it DID taste like, but it wasn't awesome. I decided to cast aside the vegan label and put some tartar sauce on these, to see if I could trick my brain into thinking it was more fishy-tasting. It did improve the eating experience slightly, but only because I could taste the fillet less. I tried a bite with lots of sauce and the very crispiest edge bit, and thought REALLY hard about fish sticks, but I was not able to trick my tongue. These could easily be marketed as chicken patties rather than fish fillets, and it would be more accurate. I didn't hate them, but there was really nothing to recommend them either.